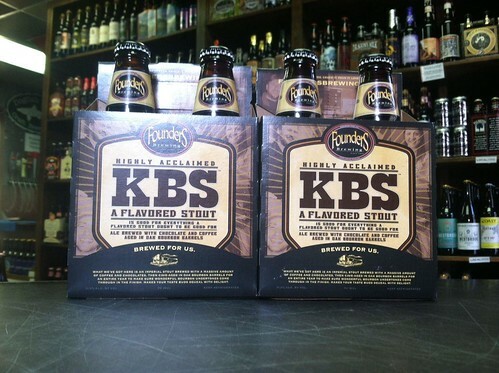 KBS returns to SC shelves | Drink. Blog. Repeat. When Founders began distribution in South Carolina again in 2012 after a years-long hiatus, so too came the possibility that some of the brewery’s more highly sought after beers would also arrive. Since they’ve come back, we’ve seen the latest releases from the Backstage Series – Frangelic Mountain Brown and Bolt Cutter – and recently began seeing the sessionable All Day IPA arrive recently after being promoted to a national seasonal release. While the official release date of KBS – their annual 11% bourbon barrel-aged imperial stout – isn’t until April 1, the beer can already be found on shelves in Charleston as the photo the Charleston Beer Exchange tweeted shows. KBS is not one to sleep on. The beer is regarded as one of the planet’s best imperial stouts and one of the best beers in general. It also ages incredibly well, so you’ll want to pick up a couple of bottles. Which is good, because chances are wherever you find KBS – if you can – supplies and how much you can buy will be incredibly limited. I agree that it’s one of the best out there (it may be my favorite beer, period), but I disagree that it ages beautifully. Now of course that’s personal preference — but if you want to swap some older bottles for fresh ones, let me know! Just for saying that, NO! But honestly, every aged version I’ve had has been pretty incredible. There’s probably a peak, but I haven’t found it yet. I have one bottle of the 2012 release in my stash that I’m saving for a special occasion. I was never really aging them intentionally, but end up doing so because I, too, treat it like a special occasion beer. I should still have a few 2010, 2011 and 2012 bottles, if I’m not mistaken. I’ve learned that I like the bold bourbon and coffee flavors that tend to fade away and smooth out with time — but like I said, to each their own! It’s just as great fresh as it is with age, but I find the flavors kind of mellow and meld better with a little time. But if a bottle ever pops up, regardless of how old or young it is, I’m not passing on it.